Delta - A militant group Adaka Boro Avengers have asked non citizens of the South-east and South-south region to leave the region. The group also warned warned south east and south south people to return back to the region as a date has been set for the declaration of the Niger Delta Republic. In a statement, on Sunday, signed by General Edmos Ayayeibo, the group said it has concluded arrangements to make the Niger Delta Republic a reality even as it ordered its people to return home and told northerners and westerners to leave the Niger Delta and eastern states immediately. It also issued a quit notice to the military and all agencies belonging to the Federal Government to evacuate the Niger Delta states and the eastern parts without delay. Failure to obey the order, it said, would lead to a total destruction of military personnel and agencies. The statement read: “We, the Adaka Boro Avengers and all the freedom fighters in the Niger Delta region have met and come to a conclusion that we are declaring the Niger Delta Republic three weeks from today. “So we are by this notice calling on the Nigerian government to move out all military personnel and all government agencies out of the Niger Delta. Failure will lead to destruction of military barracks and personnel. “We are, also, by this notice calling on our fathers, mothers, brothers and sis­ters living in the northern parts of Nigeria to return home immediately. “We are also warning northerners and westerners to leave the Niger Delta region immediately within three weeks from now, for their own good. “If they refuse to heed to our warning, we will use so many as example in the Niger Delta region on the due date. “We are telling the Nigerian government that enough is enough and we are taking our independence by force. We have our foreign backers, so we are not afraid of the Nigerian government but ready for total war. 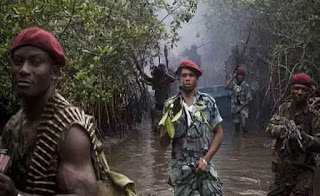 Niger Delta Avenger (NDA) claimed responsibility for blowing up of many oil and gas operations of major oil companies in the Niger Delta region said its goal of destruction of oil and gas infrastructure was to actualise the soverign state of Niger Delta. According to the group’s spokesman Col. Mudoch Agbinibo, the NDA had spread across the Niger Delta to launch its currency, passport, ruling council, territory and flag. “By October 2016, we will display our currenty, flag, passport our ruling council and our territory to the world,” NDA said.